Motion FX is a very cool real-time video effects tool that uses your Macs built-in camera to detect movement and render a slew of special effects ranging from fire to smoke and any variation of colors or distortion in between. 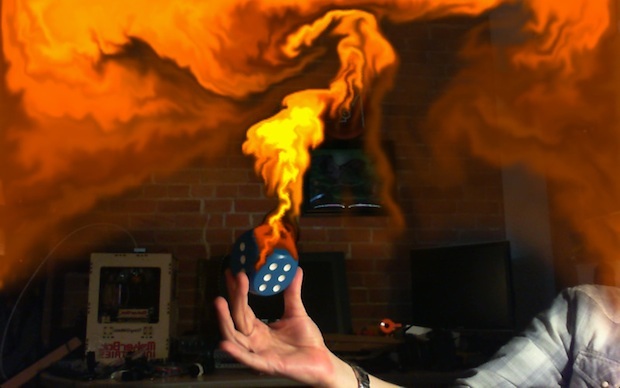 Using the apps Motion Detect or Effect Paint mode, you can literally paint with fire (or a psychedelic blend of colors) by using your hands or mouse, and create some really wild looking videos. Motion FX also utilizes OS X Lion’s facial recognition tools, so you can set any of the 80 different preset special effect modes to your head and face as well. It’s a bunch of fun and well worth playing around with. If you were wondering, OS X Lion is required because of the dependence on the facial recognition and movement detection features.